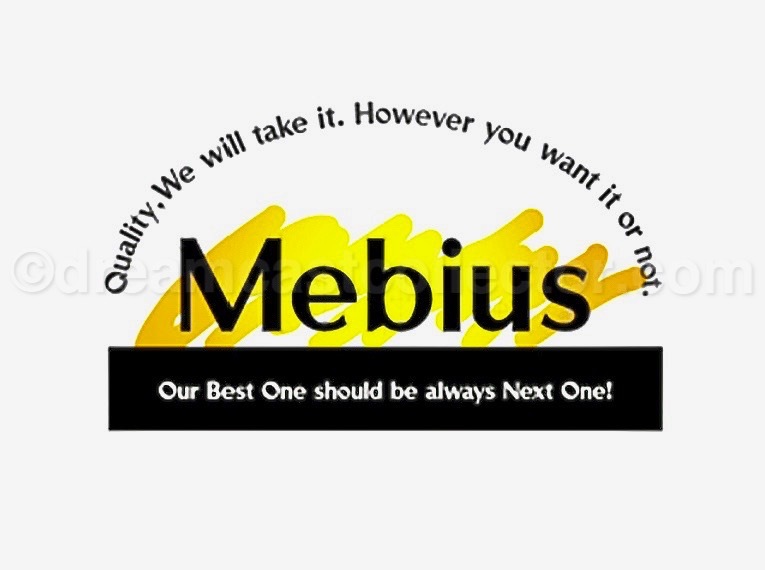 Mebius i’d wager is not a company that anyone reading this article will be particularly familiar with. This isn’t really surprising given the company has only two published titles to their credit the first being the reason for this article which was their Dreamcast title and their second was arguably their even more obscure WonderSwan game. Both these titles share another similarity as both were published in the same month of April ’99’ and then almost as immediately as they had arrived, Mebius as an commercial entity seems to have vanished without a trace. I have over a number of years tried to extensively research Mebius and been unable to find little more than i’ve just elaborated. Unfortunately, there have been a number of similarly named companies in the preceding two decades which have confusingly been erroneously attributed to being responsible for this Dreamcast release. 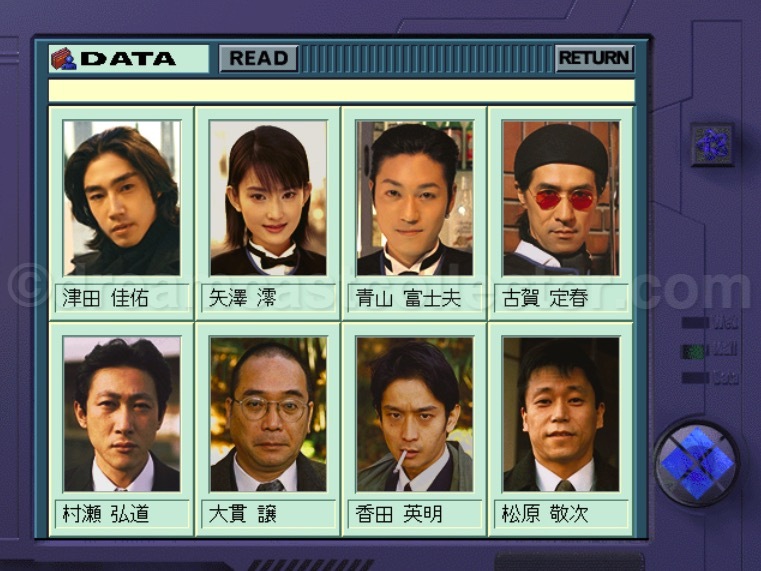 All of these are completely separate entities with no connection to the incarnation of Mebius which published this Dreamcast title. This has you might imagine has proven to be a complex situation to try and resolve as many of these companies’ titles have also been incorrectly attributed to Mebius Co., Ltd who were a licensed Dreamcast publisher and responsible for the game featured in this article. Probably the most surprising fact about Mebius is that they only handled publishing duties for what was there only release on the system about a month before it was actually published. Personally, i was only aware that they weren’t the games development studio or original publisher shortly after release due to the fact i had acquired the games original sample covers. These showcased some strange anomalies such as the actual development studio’s logo & intended publisher complete with the games original catalogue code. While the reason for the change in publisher is known and i’ll detail that further on in the article the rationale for all of the obvious traces of the games development studio being removed is something that remains an enigma. WEB MYSTERY ～予知夢ヲ見ル猫～ was actually developed by Team ‘P! Wonder who were Panasonic’s in-house game consumer development team. Certainly, at some-point the game was intended to be either published by SEGA Enterprises Co., Ltd or in conjunction with them. This is confirmed by content on an early Dream Preview disc which attributes the game to Panasonic Wondertainment & SEGA. The games sample covers prominently display the Team ‘P’ Wonder logo which was removed before the game was released as well as all references to the original publisher Panasonic Wondertainment as well as SEGA. The games original publisher Panasonic Wondertainment were originally formed just after the Panasonic M2 system had been abandoned in ’98’ and they sought to provide software for home consumers with computer and console releases. Unfortunately, according to the company’s archived site they stopped all game software development & publishing in June ’99’. Truthfully, i’m not sure the exact reason behind this decision given how short they were actually in operation for and none of the usual reasons why development studios generally become defunct seem to apply in this particular case. Below you’ll find the archived remnants of Panasonic Wondertainment’s website which announces that the company’s website will be closed. Copyright 1998 by Panasonic Wondertainment, Inc. All Rights Reserved. Unlike many of their contemporaries they didn’t cease operation and then disappear completely but rather after a short period of about two months Panasonic Wondertainment transitioned into Panasonic Digital Networkserve in September ’99’. The company’s main business interest was now solely focused on computer utilities including their prestigious MPEG1 software. This new incarnation of the company still acknowledged the previous customers of Panasonic Wondertainment on their official site. The archived remains of this new incarnation of Panasonic’s consumer software studio is linked to below. (C) 2000, 1999 Panasonic Digital NetworkServe Inc. Given that not much is actually known about the development of Web Mystery i did initially think that it possibly might have been originally intended for Panasonic’s abruptly cancelled M2 home console. Since this was only officially shelved in ’98’ and thinking of the time to actually carry out development on the game with the added pressure of filming on location in three different countries which were Japan, South Korea & finally Hong Kong seemed a plausible theory. But this as it turns out wasn’t the case as when the game was first announced it was covered by various media outlets and in an archived article by Gamespot Japan from December ’98’ Panasonic Wondertainment stated that they only began auditions in the previous month of November ’98’. This archived article about the game’s announcement from Gamespot Japan is linked to below. Copyright (c) 1998 by SOFTBANK Corporation. All rights reserved. As for the game’s eventual publisher Mebius there is simply no more information about them other than what i’ve already iterated. I’ve struggled to find their official site without success or actually confirm is they even had one. The only known confirmed information I could uncover is that they published two titles in April ‘99 and I’ve been unable to find any other information about the company. Personally, I think that they were an in-print label for another publisher but I can’t conclusively state this was the case. If I had to speculate, I’d assume SEGA was somehow involved in bringing the game to market but apart from a special thanks in the games credits nothing is confirmed in supporting my theory. There are some unusual omissions in the retail version of the game with the games title screen simply showing a © Mebius copyright but with no date. Also, there is no © credit attributed to Panasonic Wondertainment or Team ‘P! Wonder either in the game or in the manual or packaging accept bizarrely the registration card still denotes Panasonic Wondertainment as the publisher. The game was never planned to be released outside of Japan and realistically it had no chance of a western localisation simply due to its premise and content. There’s nothing particularly graphic but the implied murders and the theme of watching homicides being committed online combined with a protagonist who smokes & drinks wouldn’t really be acceptable to the various regulatory bodies in western markets. A somewhat slightly macabre element is the fact the game starts in late November and goes through to Christmas which for a game effectively about watching people being killed online through email links definitely doesn’t seem to embody the normal Christmas holiday spirit. 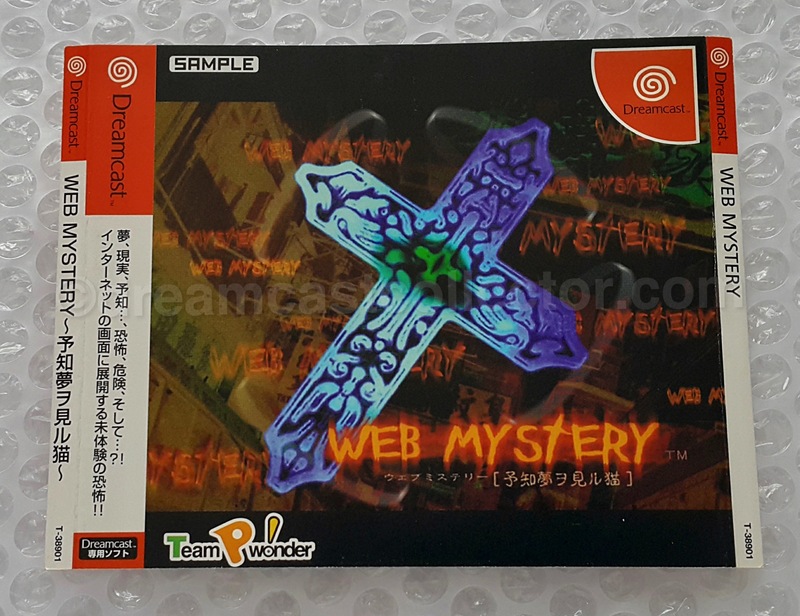 Given the convoluted history of actually bringing the game to market its unsurprising that most people aren’t actually aware of what type of game WEB MYSTERY ～予知夢ヲ見ル猫～ is. The game is arguably best described as essentially a Full Motion Video (FMV) title which also combines elements of a traditional sound novel. Given the time period when it was developed being late ‘98’ and the rise of interconnectivity through the burgeoning internet which was relatively new for most people at the time the game sought to capitalise on this emerging new technology. 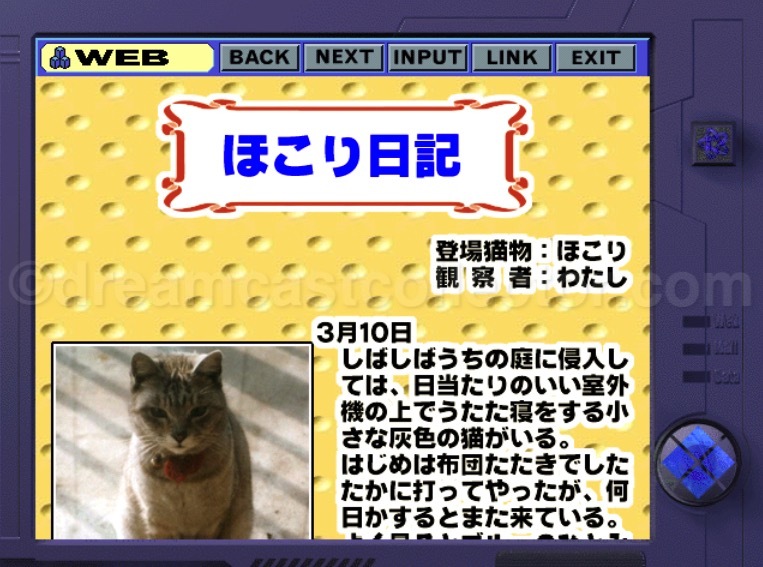 The main gameplay in WEB MYSTERY ～予知夢ヲ見ル猫～ is provided by a simulated internet interface in which you have to search various subjects that relate to the clues you uncover to advance the story or by entering search terms that relate to clues you’re given during the course of the game. The story in WEB MYSTERY is you play as the protagonist Kei played by Tsuda Eisuke who is a talented programmer who on the 20th of November finds himself visiting an internet bar called Meisen. 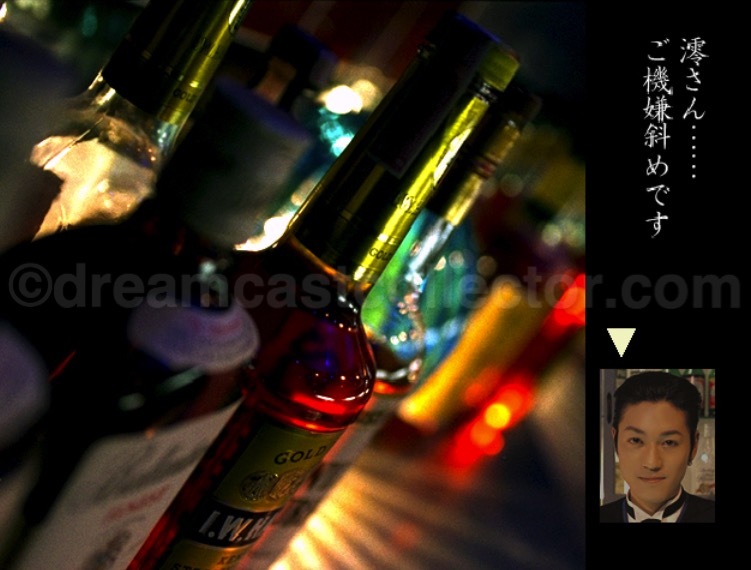 Initially you’ll meet a diverse set of characters before meeting bartender Mio played by Asahi Morikawa and you’ll set up your club membership and soon you can access the network terminals in the bar. Soon afterwards you’ll receive a strange email from a nefarious individual called DOG and when you click on the link provided it takes you to the Cat’s Eyes website which you can then watch DOG’s message which shows someone apparently being murdered in their car. Afterwards you have to choose an image on the Cat’s Eyes website that relates to the horrific video you watched from a choice of three possible outcomes. The next day the man in the video link from the CAT’s Eyes website is reported as being found dead on a news broadcast just like the video insinuated. You as Kei go to the scene of the murder and find the same object that was shown in the video. Things become slightly stranger as Kei starts to experience premonitions and while meeting Mio you return to Meisen and find you’ve received a new email from DOG who has unsettlingly close video footage of both you and Mio from earlier in the day almost as if they were right next to you. It’s actually hard to describe the overall story without ruining it for others so i won’t elaborate on it anymore for the sake of those who want to experience it for themselves. Web Mystery’s story is actually quite engaging and certainly for the time a unique premise. The only problem is the game is completely linear so it’s hard to describe it in much detail without spoiling the game as I’d obviously recommend that its best to experience the games story for yourself. 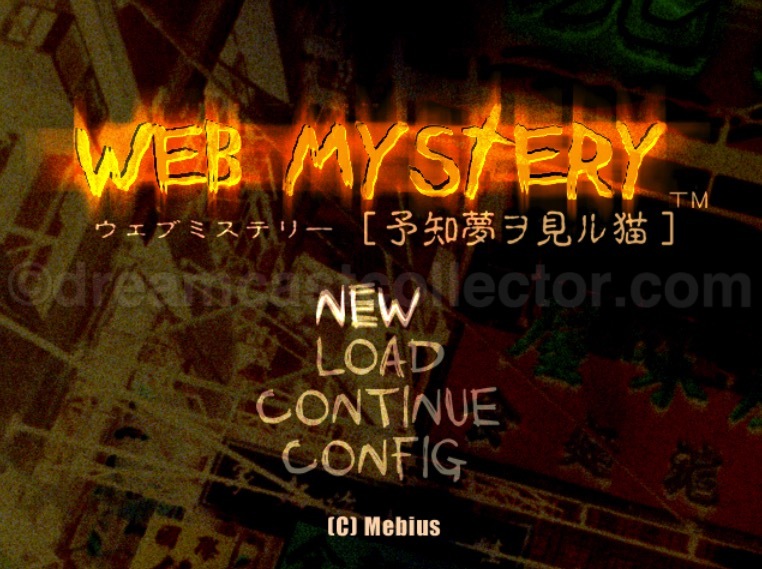 The gameplay in Web Mystery is mainly implemented with two distinct types of interactive mediums the first is through the game’s representation of a network terminal. This provides functionality through its offline search engine which has lots of interactivity and over two hundred accessible sites. While the majority of these subjects have no actual use relating to the overall story given that you only have to search specific subjects at pre-determined times during the game to advance the story it really helps to immerse you into believing your using a network terminal in Meisen. The interface also provides save & load functionality and your free to save anytime you have access to the desktop. Another feature of the terminal is the ability to watch all of the previous videos that have appeared though-out the game so far as well as being able to read files on all the characters you’ve encountered during the course of your adventure. Even through the game doesn’t actually have any real online connectivity it does adapt to events in the game with one example being the PWTV news site (Panasonic Wondertainment TV) page which after the first murder shown on the CAT’s Eyes website the following day this site covers the story of the man’s death in a news report. This is a nice touch as it definitely adds to the immersive experience of the game. This simulated version of the internet showcases just how much care & attention Team P! Wonder took in producing Web Mystery. In a somewhat strange way, the representation of the internet depicted in the game actually has content that is still commonly found online today. The continuing obsession with cat pictures is represented in the game as well as incredibly strange hobbies also being present. It’s quite impressive how lifelike the games simulated internet actually is in content even through it was designed over twenty years ago. The other interactive element is generally reserved for interaction between Kei & other characters in the game where it’s through still images with text representing the chosen character on the right of the screen. I assume this was done so that people didn’t miss important information that was being relayed to them from the various characters you meet during the games story. I actually really like the close-up shots that represent the various objects from the location being represented especially those in Meisen as theirs a plethora of glasses & bottles and other paraphernalia from the bar which are photographed in a highly stylised manner. WEB MYSTERY’s graphical presentation blends all the disparate visual elements which make up the game very well. The actual FMV footage is high-quality although being honest I don’t think it’s quite as sharp as SEGA’s other collaborative FMV title es. As I’ve mentioned the still photography used in the game while not as high-resolution as modern professional cameras can provide is still obviously impressive for a title which is twenty years old to the extent that some photos have captured some glaring visual flaws in their subjects. 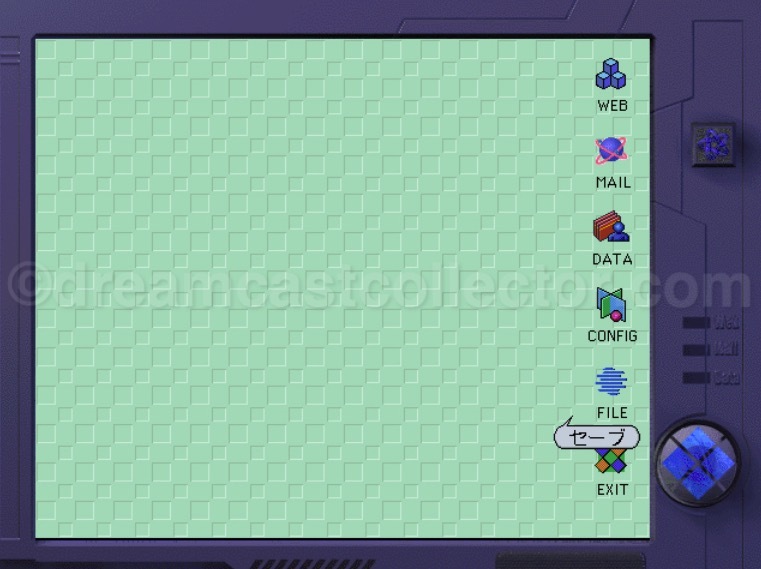 The mock interface the game employs while relatively simple by today’s standards it would’ve probably been quite convincing upon release especially for people who didn’t have either internet access or a computer in ‘98’-’99’. 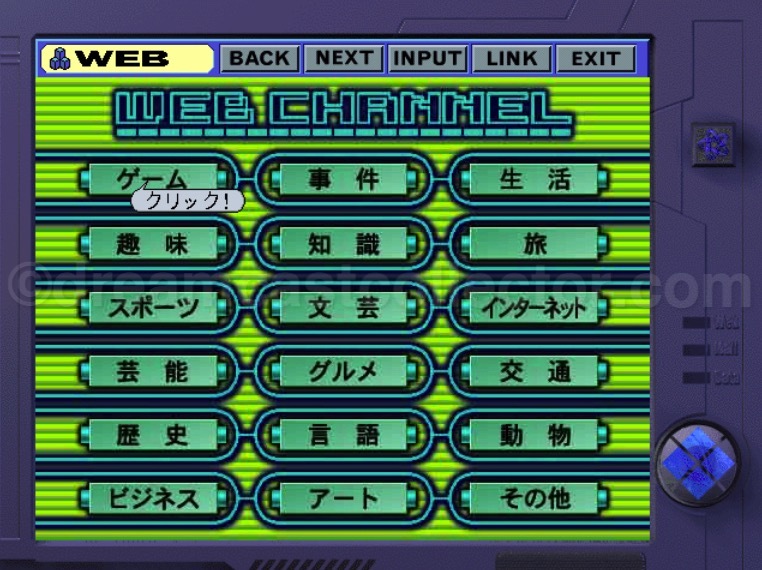 This in my opinion is quite impressive and certainly belies the fact that WEB MYSTERY ～予知夢ヲ見ル猫～ is now over two decades old. The games soundtrack is equally impressive as its visual presentation the FMV footage dialogue is always clear and the background sounds suit the onscreen action and never become intrusive or overbearing. 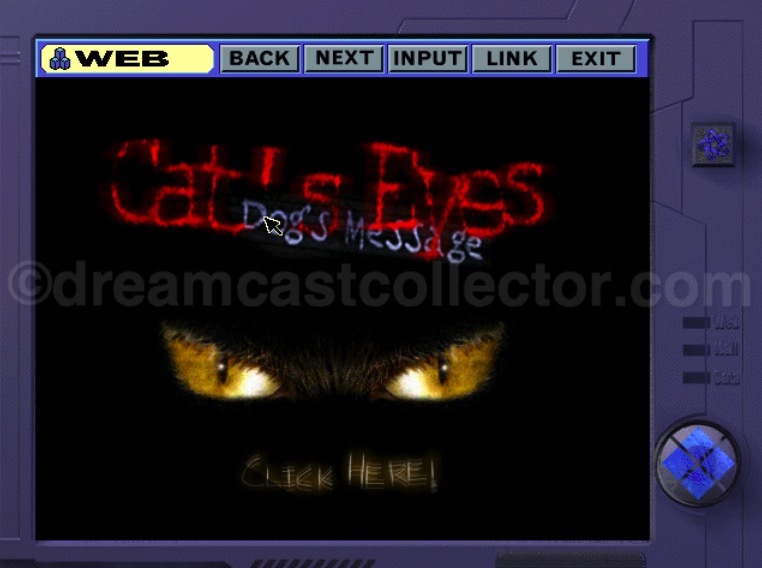 The CAT’s Eyes videos feature incidental sounds as well as other unnerving sound effects when required creating tension when viewing these clips this also applies to other FMV footage used by the game. It’s completely personal choice but the background music in Meisen where the early part of the game takes place to me is a perfect accompaniment to the still photography employed in the game. Honestly, I can’t actually describe what genre it belongs to but it incorporates plenty of traditional instruments and is quite soothing which makes for a good contrast against the other aspects of the game’s soundtrack. 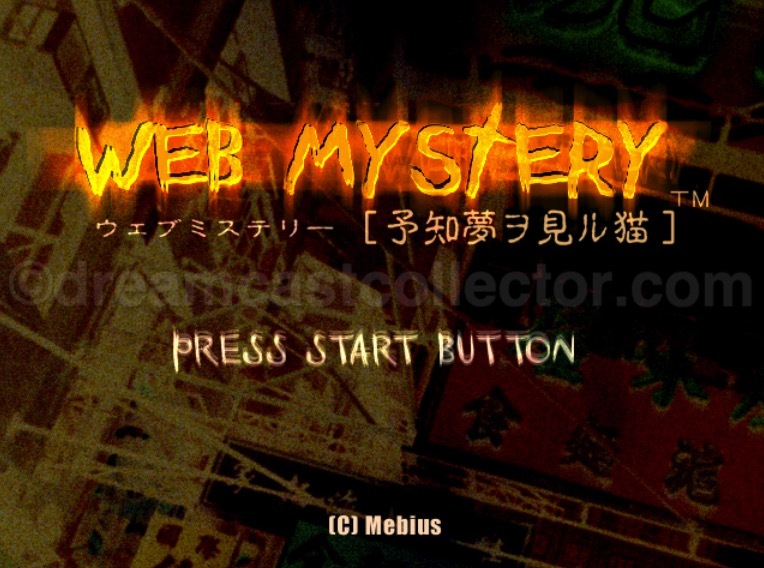 Personally, I’ve always quite enjoyed WEB MYSTERY ～予知夢ヲ見ル猫～ and have completed it multiple times during the intervening years since its release. Even with this being the case I can also appreciate that the game has a number of flaws some of which relate to the game’s genre others being exclusive to the game itself. The first of is simply being an FMV title which is a generally maligned genre. This Unfortunately, is a common feature of the genre titles in this incredibly niche genre. Its linearity precludes it from having any real replayability outside of just simply wanting to play the game again. The reason for this is primarily due to the cost of the production with multiple takes and extra shoots needed for branching pathways being incredibly expensive to produce for film and beyond the scope of most development studios. 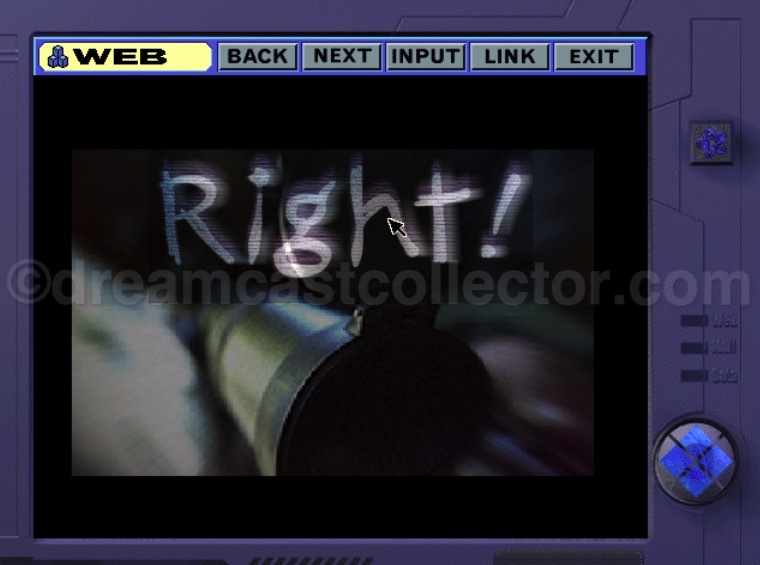 Even while the game employs a novel premise and in general is well acted the interaction isn’t as in-depth as you might expect and with the game simply allowing you to change your answers if you get a question on the CAT’s Eyes website wrong with little consequence for your choice is disappointing. If you’ve played the game before you can simply breeze through WEB MYSTERY ～予知夢ヲ見ル猫～ quite quickly. If the game featured branching paths this would’ve help to solve this but I can understand the financial constraints that the extra filming would incur. Panasonic Wondertainment probably soon after principle photography had finished had to abandon their intention to publish the game and signed the publishing rights of the game over to Mebius. Personally, for me the biggest problem i have with the game outside of its linearity is the fact that the game doesn’t support VGA output which depending on how your Dreamcast is set-up will be something of a hinderance or not even applicable. The game is perfectly playable through an RGB Scart cable but the games FMV footage & visual presentation would really have benefited from the increase in resolution offered by being able to display a VGA signal. I’m at a loss to explain why this simple procedure to enable the game to take advantage of the Dreamcast’s high-resolution display mode wasn’t implemented during development. I can only assume that during the transition from Team P! Wonder to Mebius it was simply overlooked as it appears Mebius had very little to do if anything at all with the game’s actual development. My opinion of WEB MYSTERY ～予知夢ヲ見ル猫～ is probably slightly biased as I actually quite like FMV genre titles in general this doesn’t mean however that I’m blind to the faults of games within this genre. The games premise is actually quite foreword thinking with similar themes being explored in other media currently. The acting is actually quite well done with over fifty people involved in the principle cast and the fact the game takes place in three diverse countries with plenty of on location shots helps to give a cinematic feel to the footage. Sometimes FMV games can be quite budget looking in locations or props which simply doesn’t apply to Web Mystery and its clear the game was a professional endeavour with a cast & crew able to deliver a high-quality production. 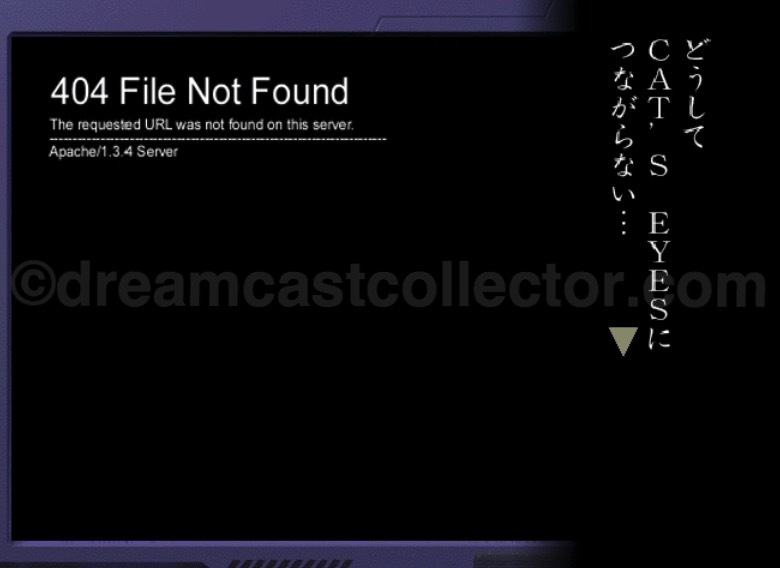 Unfortunately, the likelihood of WEB MYSTERY ～予知夢ヲ見ル猫～ ever being remastered or released on modern platforms is basically zero. This is mainly due to the licensing rights for the game Panasonic Wondertainment or its immediate successor don’t exist anymore. Mebius are a complete enigma and disappeared shortly after the games release which leaves SEGA as the only company originally involved with the game still in operation. Unlike many other niche titles that have a dedicated fanbase even in its native japan the game is almost completely unknown and certainly not considered as a title of any real note. Personally, as I’ve already mentioned I’m quite nostalgic about the game having played it many times over the intervening years and did enjoy it when i first played it and was happy to experience again for this article. 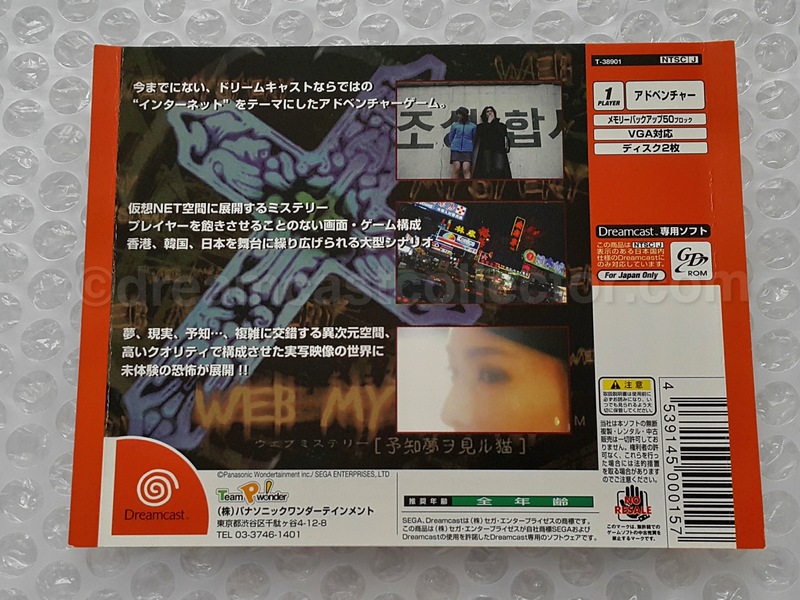 Realistically, where does this leave someone new to WEB MYSTERY ～予知夢ヲ見ル猫～ experiencing the game in the present time, I suppose unless you have a decent grasp of the Japanese language, an appreciation of niche FMV games & a willingness to play a twenty year old game with all that entails it’s probably unfortunately, best to leave the game consigned to the past. Sample T-38901 WEB MYSTERY ～予知夢ヲ見ル猫～ front. The sample cover is not quite so cropped when compared to the retail release and omits the content warning logo. Obviously when the same covers were printed Mebius had no involvement with the game and the game still shows the Team P wonder logo. Also, of note is the catalogue code T-38901 which was probably issued for Panasonic or SEGA in conjunction with Panasonic while the retail version is T-39501M which obviously belongs to Mebius. Sample T-38901 WEB MYSTERY ～予知夢ヲ見ル猫～ back. Almost a completely different back cover when compared to the retail release. The sample cover has the same list of supported items but lists 50 VMU blocks needed to save in comparison to the retail version needing just 12 VMU blocks to save. Notice the different screenshots and featuring the developers Team P wonder logo. The copyright on the retail version is simply © Mebius while the sample credits © Panasonic Wondertainment inc./SEGA ENTERPRISES.LTD. 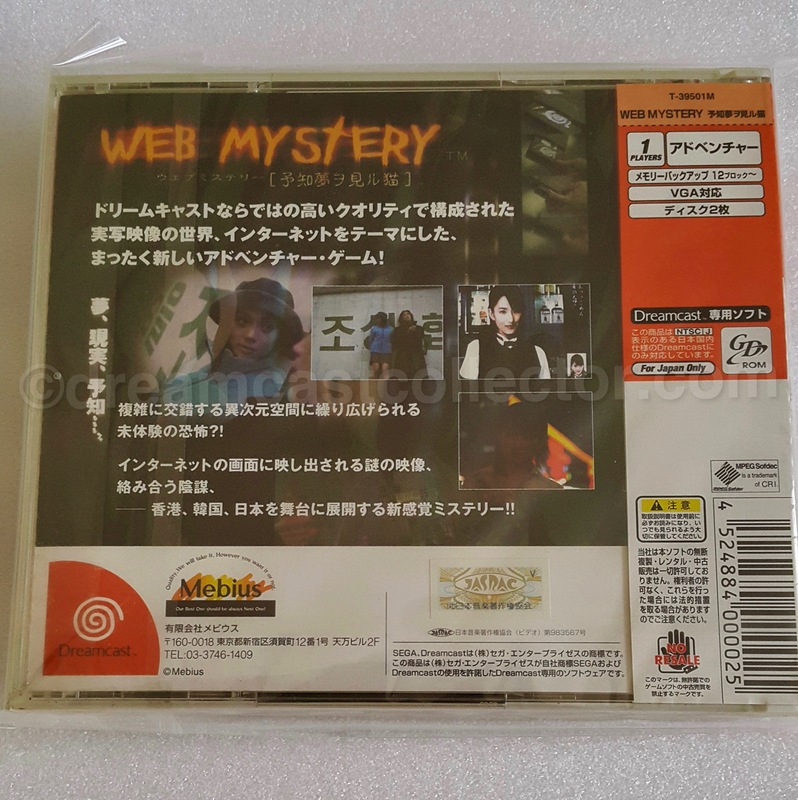 Personally, I’m not aware of any individual Not for Sale disc existing for WEB MYSTERY ～予知夢ヲ見ル猫～ and while it’s not impossible for one to exist I’d be very surprised if one was actually issued for the game. The game does have content on one of the Dream Preview discs which attributes the game to Panasonic Wondertainment inc & SEGA ENTERPRISES.LTD. Given the late intervention as Mebius as the games publisher I suspect that realistically this affected the prospect of a 非売品 disc being released in support of the game. I assume this also effected the amount of general media that the game received as while an impressive production with over fifty actors involved in its filming and the three countries used as filming locations it seems strange how little media actually exists for the game. 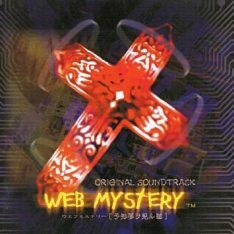 RCCX-1001 WEB MYSTERY ～予知夢ヲ見ル猫～ Original Soundtrack cover. ©1999 Rock Records All Rights Reserved. 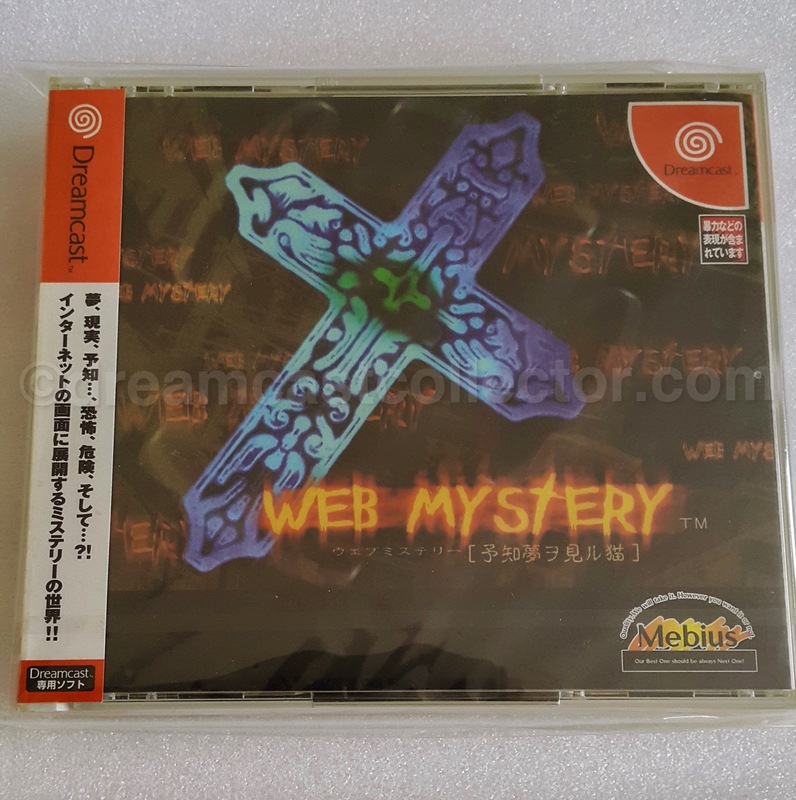 The official theme of WEB MYSTERY ～予知夢ヲ見ル猫～ was released as a single and was sung by one of the games main actors Aya Kawahara, this theme song Angel of Asia was once again released by Rock Records on the same date of the 19th of June 1999 as the soundtrack. Unfortunately, I’ve been unable to find out its catalogue code or what it intended retail price was.